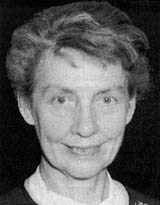 Katharine Way, a pioneer in developing techniques for the retrieval, evaluation and dissemination of information on nuclear structure, passed away in Chapel Hill, North Carolina, on 8 December 1995. Born in Sewickley, Pennsylvania, on 20 February 1903, Kay Way earned a BS in physics from Columbia University in 1932 and a PhD in nuclear theory from the University of North Carolina in 1938 under John Wheeler. After a year teaching at Bryn Mawr College, she became an instructor and assistant professor at the University of Tennessee. In 1942, she started doing wartime work, briefly in Washington, DC, and then at the Metallurgical Laboratory in Chicago, where she worked on reactor design, evaluation of reactor constants and the organization of radioactivity data on fission products. Theoretical work there with Eugene Wigner led to what became known as the Way-Wigner formula for fission-product decay. She also began to systematize the vast quantities of new results produced by wartime research, at first as a much-enjoyed hobby and eventually as the work that absorbed a major fraction of her time and effort for the remainder of her professional career. In 1945, Kay joined the Clinton Laboratories in Oak Ridge, Tennessee the forerunner of Oak Ridge National Laboratory (ORNL). She continued her analysis of fission products and began collecting and organizing the growing amount of data on nuclear decay. There also, Kay provided the seminal idea for what has become Oak Ridge Associated Universities. In 1947, Kay moved to the National Bureau of Standards in Washington, DC, where she devoted herself full-time to the data evaluation needs of the basic and applied research communities. She coauthored a series of publications that evolved into the Nuclear Data Sheets, and created the Nuclear Data Project in 1953. The project moved to ORNL in 1964, and Kay continued as its head until her retirement in 1968. In 1964, Kay arranged with Academic Press to establish a new journal, Nuclear Data Sheets , to publish the extensive data that she and her colleagues had prepared, and in 1965 she was instrumental in establishing a second journal, now titled Atomic Data and Nuclear Data Tables . During this same period, Kay persuaded the editors of Nuclear Physics to add keywords to the title page of each article, a practice that has evolved into the Nuclear Science Reference File. After retiring from ORNL in 1968, Kay relocated to the Triangle Universities Nuclear Laboratory in Durham, North Carolina, and became an adjunct professor at Duke University. By her insistence on the critical evaluation of all published basic data and her ability to combine these data into as logical and self-consistent a set of nuclear structure properties as possible, Kay influenced an entire generation of evaluation experts and the presentation of data in physics literature. Kay Way felt and expressed herself passionately not only about the analysis of nuclear data, but also about many issues of human fairness and social justice. In such matters, she was an outspoken advocate rather than merely a sympathetic bystander. In Washington, Oak Ridge and Durham, she surrounded herself with many colleagues. They all remember with affection and gratitude her keen intelligence, sharp wit and loyal decency.